Ah, the great outdoors - not enough reception to put the "phone" in smartphone, but plenty of dust and water keep it out. Good thing there are IP67-certified phones like the Samsung Galaxy S4 Active then, combining premium specs with enough durability to survive a hike or a dive. We've become a little wary of the Galaxy S label, which Samsung flagships share with a number of almost unrelated devices, which simply piggyback on their reputation. That's not the case of the Galaxy S4 Active though, it's a proper flagship. The 5" 1080p screen has been moved to TFT tech instead of Super AMOLED like on the regular S4, but LCD's are typically brighter, and plus LCDs are less likely to suffer water damage. The camera situation is less clear though - Samsung downgraded it from 13MP to 8MP and while we've seen plenty of good 8MP cameras, 13MP is the current flagship standard. Everything else seems in order, however, here's the yay and nay list for the Galaxy S4 Active. Samsung is not new to rugged Androids - the Galaxy Xcover line (along with carrier-specific versions) has been around for a while, but those favored durability over specs. 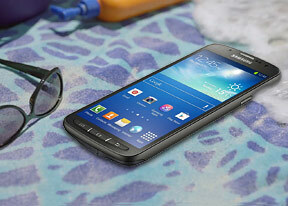 The Samsung Galaxy S4 Active is not as rugged as those phones, it is a premium package. That includes the powerful chipset, the advanced connectivity, exclusive features, the works. Of course, it's not without competition - the Sony Xperia Z has been around for a while and it's clean, elegant design doesn't pay the rugged tax - the IP57-certified Xperia Z is a suave survivor. But anyway, if you search "quad-core, 1080p and water resistance" you'll find a very short list of options. The internal hardware and the software of the Samsung Galaxy S4 Active are almost identical to those of the regular S4, the real changes are on the outside. And as luck would have it, this is what we'll start off with on the next page. No they don't, they are a silent soft touch button. I didn't like them at first but they prove themselves underwater and have grown on me.